Seniors Activities are a great way for the older members of our church to get out and enjoy some of the delightful places our region has to offer. We enjoy each others company as well as checking out some interesting places and eating delicious food, of course. The Seniors Activities are for anyone 55 or older who would like to join us, but seating on the church bus is limited so it's first come first serve. If you are interested in joining us, we'd love to have you. There is a sign-up sheet on the bulletin board at church, so get your name in early. Feel free to call the church for more information about our Seniors Activities or to register your interest. 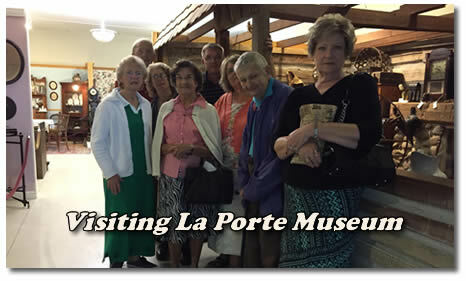 Here are some photos from our trip to La Porte Museum earlier in 2016. Also check out the amazing trip to the Creation Museum and Ark Encounter. It was truly memorable.